The international luncheon, which has been an annual part of Goshen College Afternoon Sabbaticals, will introduce Cambodia this year. On Tuesday, April 15, at noon in the College Mennonite Church Fellowship Hall, Professor of Bible, Religion and Philosophy Keith Graber Miller and his spouse Ann, a self-employed design consultant, will present a nation rich with history, a unique culture and smiling faces. The registration deadline is April 4. 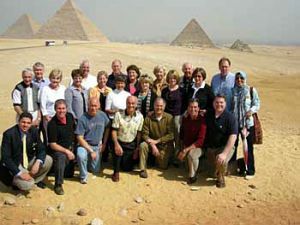 Goshen College President James E. Brenneman called for greater dialogue and exchanges between Christians and Muslims as he concluded a trip in which he led Goshen College board members and supporters to Egypt and the United Arab Emirates.